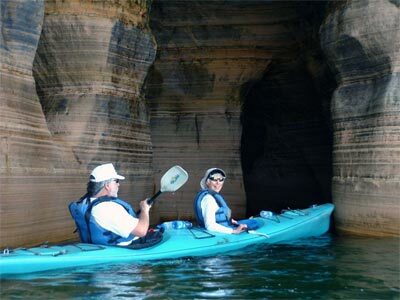 Hands down, I think I have gotten more feedback about that Pictured Rocks kayak trip a bunch of us took in June (2006) than any post I have ever written. I posted pictures but I realize that I never really wrote anything much about the trip itself. Since people seem interested both in the trip and kayaking in general, here goes. The trip was my cousin Aimée’s idea. She lives on Lopez Island, WA and is an expert kayaker who guides expeditions around the San Juan Islands. Others on the trip were her mother (Radical Betty), her brother (Grinch), me, and my 21-year-old daughter (Lizard Breath), as well as a father-daughter team who signed up independently. Our ages ranged from 13 to 84 with levels of experience all over the map. Our trip was guided by Northern Waters, which operates out of Munising, Michigan, a 2-hour drive from our family’s beach near Brimley. Betty and Aimée drove over there the night before and stayed in a motel. Lizard and I drove over early the next morning, as did Grinch. We met in the parking lot at 9 AM, where we paid for the trip ($115 each adult), signed releases and were fitted with wet suits and life jackets. There is no bathroom on the premises so we drove down the street to the Shell Station and topped off the tank in order to use that one. We drove about twenty miles to Miner’s Beach to launch the kayaks. (There was an outhouse there.) We decided to use three tandem kayaks (me and Lizard, Betty and Grinch, and the father-daughter team) and two singles (the guide and Aimée). Transporting the kayaks between the parking lot and the beach (and back) was just about the most difficult part of the trip. From the water to the top of the bank, there was a steep incline with deep sand to trudge through. The single kayaks are significantly bigger and heavier than my little Walden Vistas and the tandems are huge. It took four people to schlep one of those. Fortunately, we had Grinch and a few amazons to help :-). It was a very hot day (mid-80s) and when we got all that gear down to the beach, I hit the water in short order! Once on the beach, the guide showed us how to put on all our gear, helped us adjust our foot rests or peddles pedals (thought that word looked a little weird) correctly and then gave us a lesson on paddling and steering, etc. After we launched, we had a little time to practice as we headed west around the rock formation known as Miner’s Castle. I have been kayaking for a number of years now but I have never paddled a tandem or steered with a rudder, so that was all new and I learned some other things too, making the lesson very worthwhile. After Miner’s Castle, we headed to the end of Miner’s Beach, where we swam again and ate our packed lunch. Ours was Liz’s pasta salad, soon to appear on my blahg. Aimée shared some canteloupe and dark chocolate with the group. As lunch ended, the sky over Grand Island started getting a little dark and threatening and we could hear some rumbles of thunder. The guide listened to his weather radio and found that there were pop-up style thunderstorms, some severe, in the Keweenau Keweenaw (sorry, too lazy to look up correct spelling) Peninsula to the west and near Manistique to the south but nothing significant in our area. A rule of thumb in uncertain conditions is that if lightning appears, wait twenty minutes and reassess. While we got our kayaks ready to go again, we kept a watch for lightning and when none appeared, we launched for the second half of our trip. It was the right decision because the dark clouds turned out to be a “plassover,” as we often say on the beach. For this half of the trip, we went the opposite direction, eastward, which is where we saw most of those beautiful colors. (The pictures I have on the web do not really do the colors or rock formations justice because they are optimized for faster loading.) There were waterfalls, little caves to nose the kayaks into and places where water seeped through many feet of sandstone and “rained” on us. At one point, the guide rescued a wayward garter snake from the water and we brought it back to the beach at the end of the trip. Another interesting event was when a small rock fall occurred within feet of where we were kayaking. Aimee, who was probably the closest and has experience skiing in avalanche country to boot, beat a fast retreat from that. I’m sure we were all thinking about when one of the huge rock towers on Miner’s Castle suddently decided to drop into the lake a month or so previously. We were roughly in the area of “B” on this map from the Northern Waters site. Miner’s Beach and Miner’s Castle are marked. Kayaking? Is it safe? Can anybody do it? Don’t you tip over a lot? What about the Eskimo Roll? I am no expert but, to me, kayaking is an intuitive sport, much like cross-country skiing. The technique involved should be accessible to anyone in reasonably good health that gets regular exercise. A lesson or two never hurts but, if you are just going to paddle around a lazy river, it’s easy enough to just get in and start paddling. Although I have experience, I regard bodies of water like Lake Superior with a lot of respect and appreciated being with a guide at the Pictured Rocks. Although Northern Waters does not require experience for their day trips, some restrictions are in place, mainly regarding weight, to weed out marginal participants. For example, the 75 pound minimum weight requirement keeps out little kids, for whom this trip would *not* be appropriate. I got the idea that the guides will tailor the trip somewhat according to the skill level of the group in general. For instance, I suspect if they perceived that people were getting tired, they may turn back toward the beach a little sooner. But that was not characteristic of our enthusiastic group!